Visit Pupil Zone (Pzone) to find exciting things to do and make linked to the topic and bird of the week! 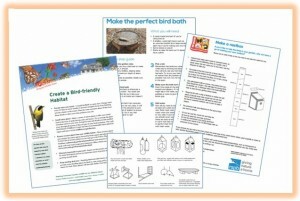 Make your school grounds and gardens bird friendly! Here are eight great things to do to attract birds to your school grounds and gardens. Provide water all year-round - A simple birdbath is a great start. Change water every 2-3 days in summer and use a heater in the winter. Grow in the ground native plants - Select a variety of plants to offer year-round food in the form of seeds, berries, nuts, and nectar. Do not use insecticides - These can kill insects that are a primary source of food for many bird species. Keep dead trees - Dead trees provide homes for birds to raise their young and are places where insects can be found. Hang outside a nesting box - Make sure the box has ventilation holes at the top and drainage holes below. Build a brush pile - Start on the ground with larger logs and on top place smaller branches. Some birds will hunt, roost or even nest in brush piles! Add a bird feeder - Bird feeders are great sources of food for birds during the winter months. Reduce your grassed area - Grassed areas have little value to birds or other wildlife so think about replacing them with plants and other features. Everyone loves to see birds visiting their school grounds, garden, patio or balcony. Watch this video to find out what simple steps you can take to attract small birds all year round. Click on the image above to play this video. The Magpie is a member of the Crow family. Its head, breast and back are black, while the shoulders, stomach and sides are white. A pair of Magpies will build their nest in a large tree using small branches and twigs, and line it with mud and vegetation. The female blackbird will on average lay 5 to 8 pale blue eggs in April. Jigsaw Challenge - Click on the photograph and see if you can fit together the pieces of The Magpie jigsaw in less than 60 seconds!